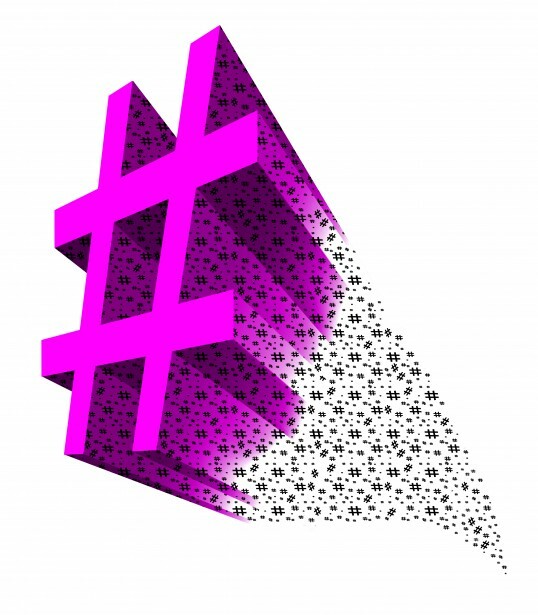 You’ve probably seen #hashtags everywhere, but what exactly are they? How does a pound sign (#) turn a simple word into a tool? And what is its purpose? To put it in simple terms, hashtags help categorize things. For instance, if you’re on Twitter and you’re talking about something specific like #music then by tagging it(using a hashtag) you lump that tweet in with all of the others that are talking about music. Hashtags group related tweets together. If someone were to look up “music” your tweet would be in the stream of tweets related to the search. This increases the visibility of your post and then your engagement. The picture below shows how the amount of hashtags you use affects how many people interact with your post. Hashtags are a great way to help get your message out there. It increases engagement for your posts, and widens your audience. But hashtags can only help spread the word—they are not the message. Your post still needs to be compelling. You want to create the best post for heightening engagement with using the right amount of characters. You also don’t want to be spam. Use hashtags sparingly. A lot of people, when they are just starting their hashtag journey, put all of their tags at the end of their post. There is nothing wrong with this. It gets the job done. But one of the great things about hashtags is that it I can be part of the language. You’re certainly welcome to use a hashtag in the middle of your post. You don’t want to just use random hashtags. You want the hashtags to be useful. To do this, you want to consider the best tags to use for each tweet. Hashtags group related posts together. It makes no sense to be the only one using a hashtag because then you’re not being related to any other posts and no one will look up your tag. Your hashtag’s meaning also needs to be quickly recognizable. People need to understand what you’re trying to say quickly or it’s just a combination of letter with no real meaning. Readers are not code breakers, and most of them don’t want to be. There is such a thing as using a tag that is too popular. You want to find the right balance for each post. If too many people use the same tag then your post is just being swallowed by the void. To check how popular your potential tag is, I recommend using RiteTag which will help you find a tag that’s just right. So you’re thinking “Well that’s great Tomoson, but what does that have to do with you?” or if you weren’t thinking it, you probably are now. Tomoson is a magical place where we help businesses achieve their dreams. When making a promotion on Tomoson businesses are prompted to enter hashtags that the influencer should use when promoting their product/service. This is where your thoughtful tag considerations come in. 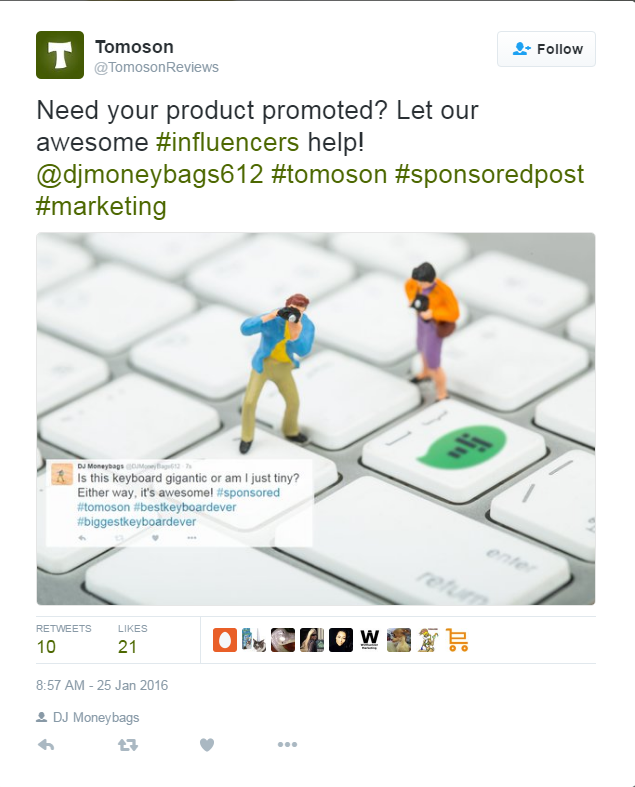 Influencers will use the hashtags that you provided to them to further promote your product. Using a hashtag with Tomoson that is more specific to your product(s) you are able to see how the product is discussed. For example, if you're selling a #rainbowrubberduck (honestly just because I really want a rainbow rubber duck) and your influencers use this hashtag you'll be able to quickly look at posts surrounding your product. Or if you use the business name like #SellingDucksToday you can see any of your promotions using that hashtag. It is as simple as supplying influencers with the hashtags you want them to use.